There are three main types of yellow peonies and eventually each of these types will be included on this site. These three types can be grouped into two major categories, tree peonies and herbaceous peonies. In the near term, this site will focus on the yellow herbaceous peonies which are the newest and most exciting of the yellow peonies. 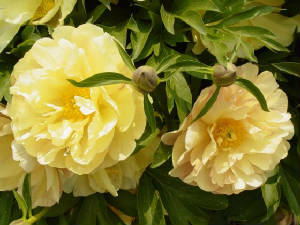 In the future, pages devoted to the yellow tree peony hybrids will be added as well. This site was created in July, 2002 and is still not completed. Much of the material and informatiom planned to appear on this site is now on other sities such as intersectionalpeonies.com and paeonianewletter.com. However, the links which will take you to these other sites do appear here. Yellow herbaceous peonies are divided into two main groups, herbaceous hybrids and intersectional hybrids. The herbaceous hybrids result from crosses between various species of herbaceous peonies and are thus intrasectional hybrids. The intersectional hybrids, on the other hand, are the result of crosses between tree peonies and herbaceous peonies. As a result of their primarily herbaceous plant and growth habits, these new hybrids are usually grouped with the herbaceous peonies, although they are really a distinct group. These hybrids are new, rare and very expensive. In the near term, this site will concentrate on the yellow intersectional hybrids. Pages on other yellow herbaceous peonies will be added at a later date. Thanks for visiting yellowpeonies.com. I hope to update this site often with new photos and information, so check back frequently for new material.